Is India's Military Actually Ready for War With China? A recent report from India’s Comptroller and Auditor General (CAG) raised a red flag over defense preparedness. As India and China continued their standoff on the Doklam plateau at the Sikkim-Bhutan-Tibet tri-junction, there is a possibility, if the Chinese media is to be believed, of imminent war. Both the print and the electronic media in China have gone ballistic with propaganda against India. Over 140 articles have appeared in the print media branding India as an aggressor, and warning it of unavoidable consequences if it fails to unilaterally withdraw its forces from the disputed territory. The present dispute is between China and Bhutan, not India, but since New Delhi has a friendship treaty with Bhutan, which includes protecting its sovereignty, India had rushed troops to Doklam to remove Chinese soldiers from the disputed area. China is miffed with India as the disputed territory does not belong to India. India, on the other hand, is concerned that if China builds a road on the plateau, it could have serious security implications for India, as it will give it easy access to India’s northeast region via the Siliguri corridor. India has raised its security concerns with China and has offered a solution, where both the armies withdraw from the disputed area and maintain the status quo until a final resolution is found to the dispute. China has not responded to India’s suggestion that both the countries push back their troops by 250 meters from the disputed territory. Instead, China has insisted that India unilaterally withdraw its troops from the Doklam plateau, while refusing to withdraw its own troops. China has also refused all diplomatic overtures from India to amicably resolve the issue. Would India’s military be ready if China decides to forcibly capture the region? India’s Comptroller and Auditor General (CAG) had issued a report in the Indian parliament on July 21, raising several serious concerns over India’s defense preparedness. At a time when India is facing hostility from both Pakistan and China, the CAG report raises serious doubts as to India’s capabilities. Among other concerns, the report finds serious faults in the maintenance of IL-76 transport aircraft and upgrades of fighter aircraft, as well as the reliability of India’s missile systems. India’s military has said it wants 42 squadrons of jets, around 750 aircraft, to defend against a two-pronged attack from China and Pakistan. But with old jets like the MiG-21, first used in the 1960s, due to retire soon, it could end up with only 22 squadrons by 2032. India’s fleet of old military planes has been suffering an alarming rate of crashes, including 39 in the last four years, according to data released in February. Since then, there have been even more accidents, including two MiG-21 jets that crashed in September. The CAG also pointed out that although the government of India announced last year that it would deploy Akash missiles at six designated sites near the Indo-China border to act as deterrent, it has failed to install the missiles at even a single site. The report further adds that the failure rate of missiles is too high by international standards. The CAG report is a major setback for the indigenization effort of the “Make In India” initiative championed by the prime minister to reduce India’s dependence on imported arms. In early June, Army Chief General Bipin Rawat had said, “Indian Army is fully ready for a two and a half front war.” The general’s rhetoric looks like an empty boast, however, if one goes through the CAG report. The report finds all three services wanting. Another damning finding is that, for 40 percent of critical ammunition types, Indian army only has enough stocks to last for 10 days of fighting. China may have studied the CAG report on India’s defense preparedness and is, therefore, warning India of serious consequences should the strand-off continue. Military power is heavily stacked in favor of China. In fact, China dwarfs India in overall defense capabilities: compared to India, China has nearly one million more troops, five times as many submarines and tanks, well over twice as many military aircraft, and nearly twice as many warships. China also has three times more nuclear warheads than India. Moreover, its defense budget stands at $152 billion against India’s $51 billion. Despite the military advantage, Beijing has little to gain by attacking India. It has a lopsided trade with India, and in the event of any war, China will stand to lose heavily if it chooses to attack India. Moreover, as both the countries have nuclear capabilities, India may exercise its nuclear option if China tries to invade India. Further, a war may force India to more formally join the U.S.-Japan axis, including by sending its naval frigate to the South China Sea. China realizes that it may not succeed in riding roughshod over India, especially when it has a decisive Indian Prime Minister Narendra Modi at the helm. Modi has taken steps to build the capability of India’s Army, Air Force, and Navy. 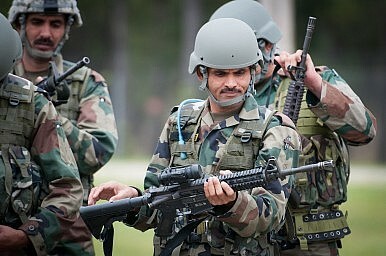 The government of India has recently decided to allocate $416 billion over a five-year period to strengthen and modernize its forces so that is better prepared if any one of its neighbors decides to attack. However, war is not an option for India with its current level of military preparedness. It needs to settle the border disputes through dialogue. Moreover, at a time when China is trying to counterbalance U.S. power, a war with India will have serious consequences for its credibility in the region. The leadership of both countries should show wisdom and maturity to end the present impasse through dialogue. K.S. Venkatachalam is an independent columnist and political commentator. The crisis drives home Nepal's delicate position as it tries to balances ties with its neighbors.